Language B is a great way for individuals to study foreign language. If you're interested in studying from the public lessons we've created and practicing that lesson content with our growing variety of games, then Language B is free! The free option also allows you to search for other lessons in our database that our subscribers have created and shared with the public! In addition to the free option, a paid membership will give you access to the entire set of tools we use at Language B to create lessons for your own personal study, or to share with your friends or with the entire Language B community. We give you complete control over who has access to the lessons you choose to share. A membership will also let you create and manage groups in Language B, so that you can share lessons you find or create with your friends or with native speakers. If you enjoy teaching your own language to friends who want to learn, then we've built Language B to be your ideal platform. 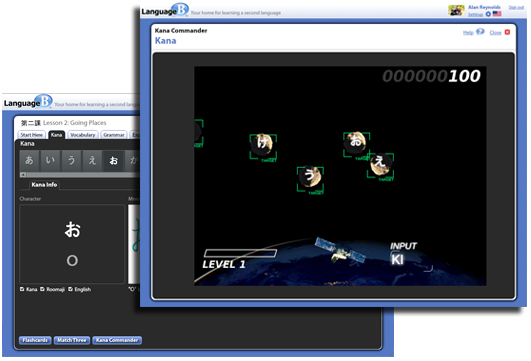 We've made it easy for you to create custom language lessons for your friends to practice. They'll enjoy seeing the pictures and video and audio you add to go along with the text you write, and all of that media will be instantly available for enjoyable practice in our games! Although Language B is primarily focused on language study, you can easily create study guides for any topic that you're studying. For instance, if you build a list of terms from a science textbook, you'll be able to immediately practice those terms in a variety of games. You can use this capability to build fun study guides for any topic: science, history, music and art.